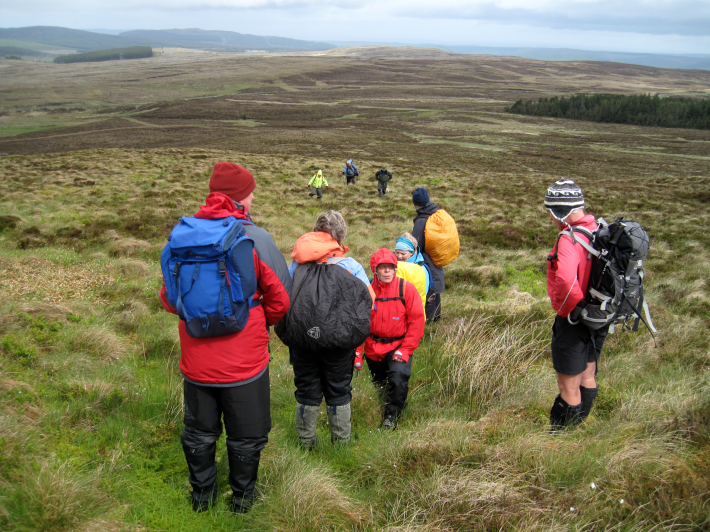 A cold damp and blustery morning saw twelve intrepid walkers gather at the Kirriereoch car park for today’s walk. 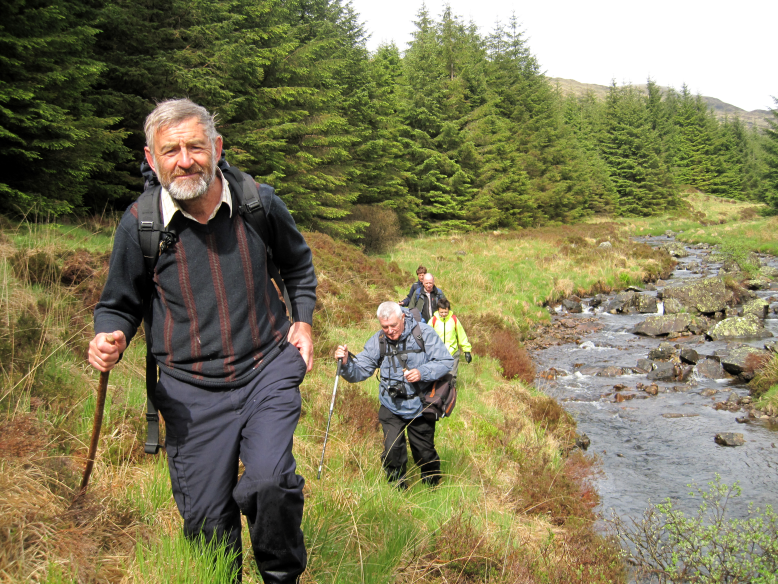 Two new walkers were welcomed to the group. Cath, Thomas, Frances, Jacqui, Leslie, Douglas, Forbes with Lily, Jim with a visitor, Paul and our leader, Brian, with Valerie. They both took their cars to the end of the proposed walk and Brian brought her back. After leaving two cars behind, the group now travelled up the Straiton road for a further six miles for the start of the walk. A few miles north of Waterhead on Minnoch they parked up in a disused quarry cutting and began to climb. The going was typical rugged Galloway Hills terrain. 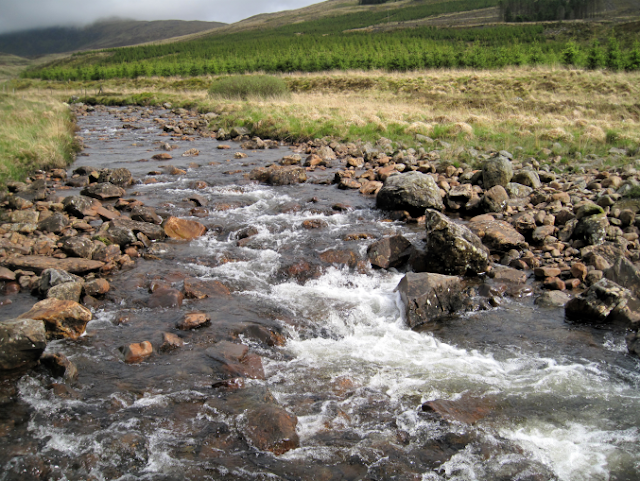 Tussocks, heather and bog meant that progress was steady as they crossed their first obstacle, the Pilnyark Burn. Brian had warned us that the first mile would be hard going and he was right! 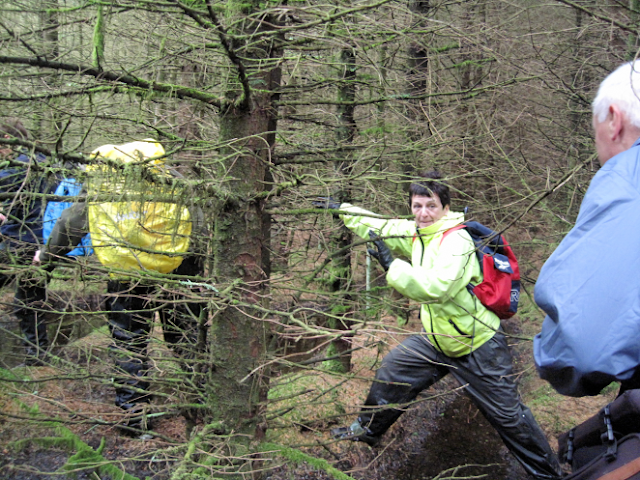 Trying to make our way upwards through thick heather in a boggy area was really difficult and it tested all of us but the terrain did eventually get easier. It was misty a lot of the time but we kept getting glimpses of the spectacular surroundings. Eventually they reached their first objective, Shalloch. From here they could see Ailsa Craig to the west and to the north Cornish Loch and Loch Bradan. A number of small lochans were skirted around. As they continued climbing the going became a little easier. Blaeberry and Bog Cotton were prolific. Bog Cotton - or Cotton grass used to be used in the past for making candle wicks and also for stuffing pillows. It was also used in wound dressings during the First World War. Nowadays it's considered commercially unviable for harvesting. Now they were climbing south easterly on the slopes between Caerloch Dhu and the Pottans. Below them the Rig of the Shalloch was prominent. Cloud cover obscured all the summits of the 'Awful Hand' range. Arran and Ayr could be seen to the north and west. 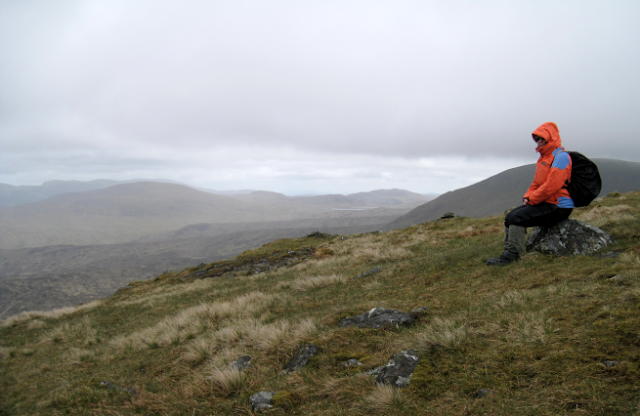 When we got to the top of Shalloch on Minnoch it started raining more steadily but we sat in the stone shelter by the trig point and we were was pretty well sheltered with our backs to the prevailing wind and protected by the wall. 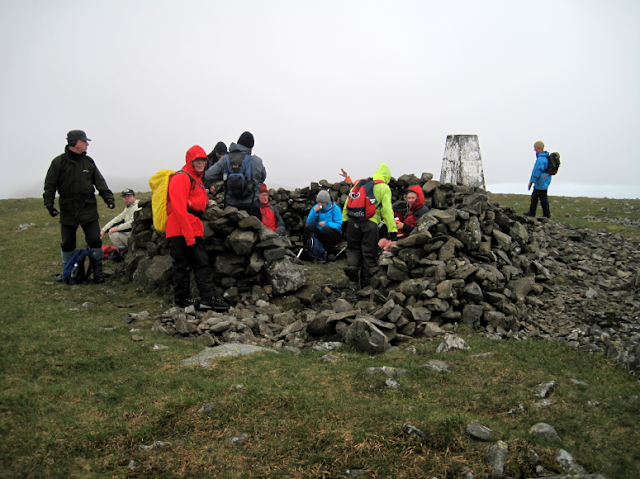 Upon reaching the trig point (768) and stone shelter on Shalloch on Minnoch, optimism that the weather was going to improve was soon dashed as the wind and rain increased. 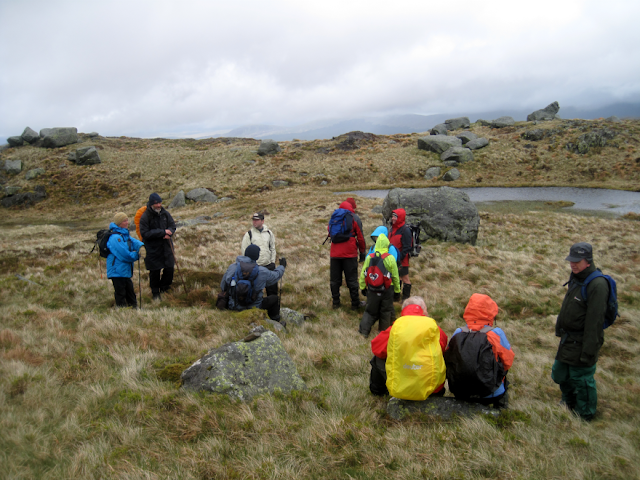 A cold and damp lunch break followed. Despite the conditions, lots of light hearted banter bolstered morale. 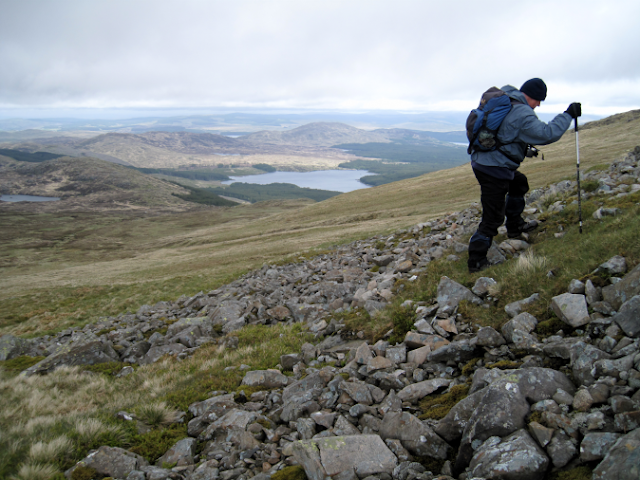 After lunch they now moved east to the highest point on the Corbett and the highest point in mainland Ayrshire. (The Isle of Arran is managed by North Ayrshire Unitary Authority so technically Goat Fell summit is its highest point). When we got up to go my hands were pretty cold and when we stopped to gaze down from our steep vantage point on the many lochs I had to stop taking photos as my fingers were freezing. As we made our way down the Nick of Cardach we could see Kirriereoch beyond Tarfessock and the Merrick in the far distance. I would have loved to have taken more photos as we went down but I had to keep my gloves on and wrap my fingers around the hand warmer which I had activated at the beginning of the walk. 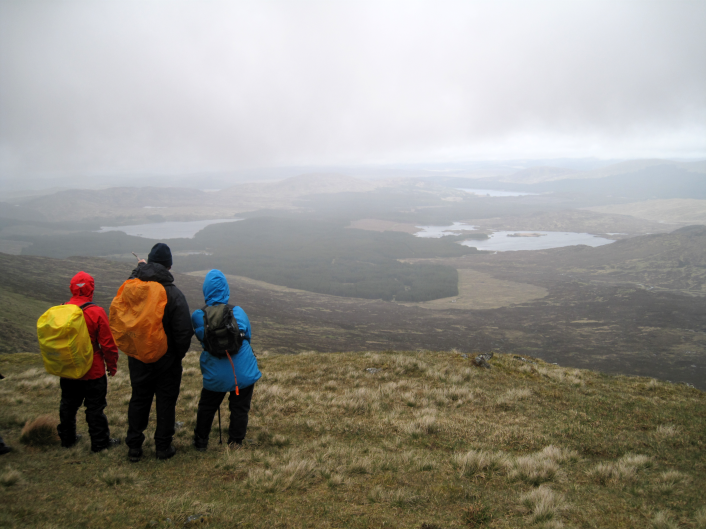 At 775 metres high and above the rocky crag known as Maidens Bed the views when the clouds occasionally cleared were spectacular. Below to the north east were Lochs Macaterick, Riecawr and Doon, east standing tall was Corserine and to the south Loch Enoch. Tunskeen bothy, far below, restored in 1965 saw the MBA (Mountain Bothies Association) being formed. Now the group made their way to Tarfessock via the Nick of Carclach. The drop in height took them below the clouds and afforded more views of the surrounding rugged countryside. 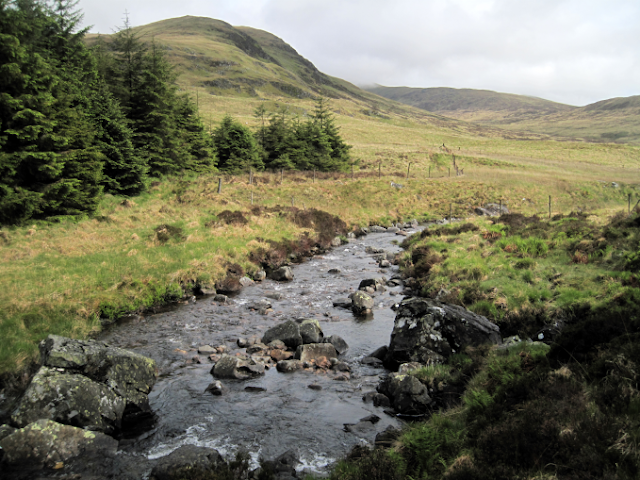 Lochans and rocky outcrops were passed until they came in sight of the steep slopes of Balminnoch Brae leading up to Kirriereoch. It was time to begin the descent. 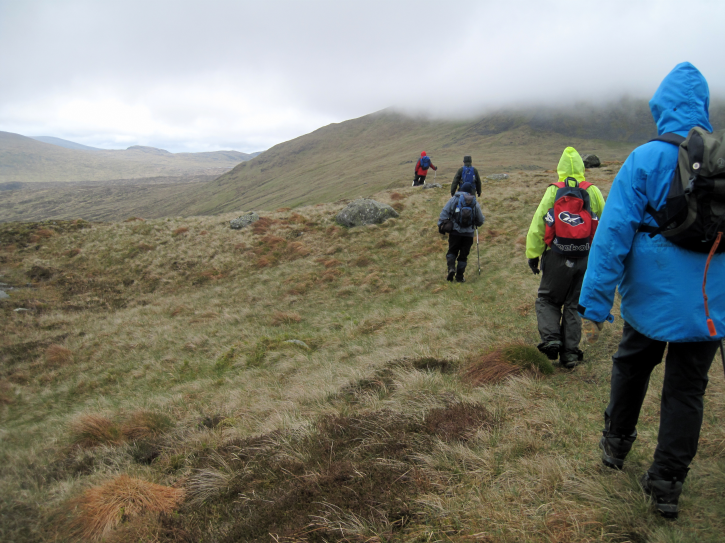 There was some discussion about going on up Kirriereoch but the majority of us preferred to start our decent as the mist covered its top and the rain was still present, intermittently. The descent followed the course of the Cross Burn. For a while the weather worsened and wind and driving rain were endured. Stumps are all that remain at the site of the now demolished Cross Burn bothy. Remembered by a few of today's walkers it was wigwam shaped. As the weather cleared and the sun began giving occasional glimpses, the exit to the forest road was inadvertently missed. The group continued the descent to where the confluence of the Cross and Kirshinnoch Burns become the Kirriemore Burn. 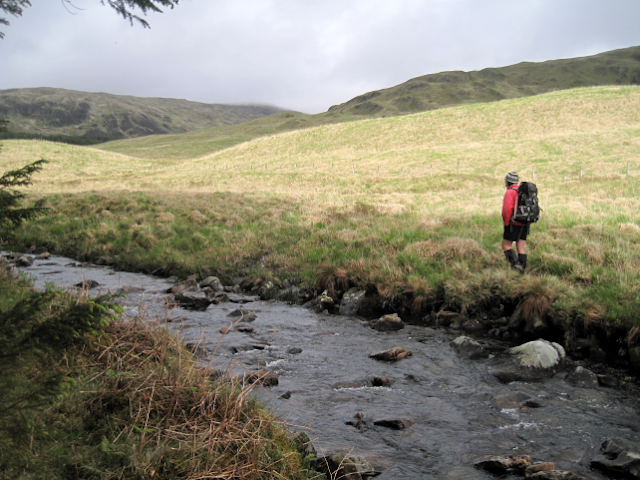 An unsuccessful but entertaining attempt to find a way through the forest resulted in a short retrace of steps back up the Cross Burn to the Pillow Burn and the forest road. Brian crossed the burn for an easier return ascent. It still seemed a long time until we caught sight of Val’s car, viewed over the stumps and discarded branches of felled trees. When we reached the forest road Lily was struggling with, she thought, a pulled ligament but it proved to be cramp.